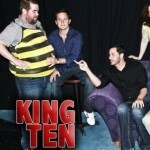 King Ten is iO West’s longest running house team and one of the premier improv ensembles in Los Angeles, now celebrating their 10th year. Audiences pack the house every Wednesday night at 10:30 p.m. to watch King Ten perform iO West’s signature piece, The Harold, and to enjoy the original, ambitious and hilarious style of play this ensemble is known for. Individually these veteran improvisers have appeared in national television series, commercials and feature films, as well as taught classes, workshops and coached teams at iO West. Their show is not to be missed. King Ten is Jon Crowley, Josh DuBose, Kim Garr, Karen Graci, Dave Hill, Jason Pardo and Nick Armstrong.